Everything larger than 10 x 10 is drive-up. Smaller units are located on hallways. Our main building, about two acres, is kept between 55 and 60 degrees in the winter and stays naturally cool in the summer. There is a fire sprinkler system to protect your belongings. All units are 10 feet high. Two driveways run across the building. Enter your personal code number to drive in. Load and unload and organize your things protected from the weather. Drive right up to the larger units. The smaller units are down a short hallway. You provide your own lock. 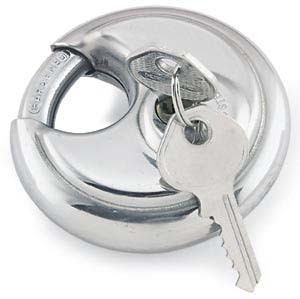 We have some for sale in our office or you can bring your own, but we do require you to use a “disc” or “closed shackle” lock because we feel they are much more secure than ordinary padlocks. Note: sizes are given in feet and are approximate. Access is limited to office hours. For security reasons, we do not allow customers in the building when our staff is not there to keep an eye on things.